Motion sickness (commonly known as travel sickness) can be a problem with various forms of transport - sea, road, air, or train travel. Similar symptoms can arise in cinemas with large screens and on roller-coasters. They are caused by a conflict between the body's visual, balance and coordination senses. A similar reaction is related to fear of heights when looking down from a high roof of a building, from the top of a ladder or over a steep slope on a mountain. It is rare in those under two years of age but becomes common in later childhood. The usual symptoms are rapid onset of nausea, pallor and sweating followed by vomiting. 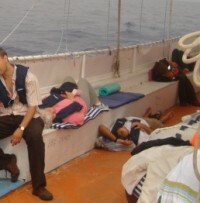 On a ship, adaptation usually takes place after 2 or 3 days and lying flat in the most central part of the boat with the head towards to bow may help - this minimising the rocking motion. It is much less common on large cruise ships with special stabilisers than on smaller craft. In a road vehicle motion sickness can be prevented by sitting in a front seat, where the passenger can looking forward through the windscreen. It is often precipitated by trying to play games, use a computer or read while the car is in motion. There are many different tablets available for motion sickness although side effects and duration of action vary. Most are available from pharmacists. Alcohol potentiates the sedating effect of all these drugs, and all may impair driving ability. Hyoscine is a short-acting antispasmodic and probably the most effective medication for travel sickness but it is associated with more side effects, such as dry mouth, drowsiness, and blurred vision (it is contraindicated in glaucoma). Hyoscine skin patches (applied every 2-3 days) are helpful for long journeys but may be difficult to obtain. Cyclizine is a short-acting anti-histamine with minimal sedating effect and can be repeated. Meclizine, Cinnarizine and Promethazine are also antihistamines and are longer acting. Absorption may be limited in the presence of vomiting so a regular sufferer should take them in advance.